As Conservative Party leader Rodney Richmond lies in a coma, his ambitious deputy Colin Scott vows to force unquestioning loyalty to himself on a party which is at breaking point. Dubbed ‘the Führer’ by Labour MPs, his core supporters – including a morally conflicted colleague and an obsessed, ruthless advisor – will do anything to get their man, and themselves, to the top. But there is a threat from within, one so determined they will resort to murder before they see Scott fail, and soon civil war erupts among Scott’s most senior lieutenants. While the true leader of the so-called ‘resistance’ remains unconscious, their female rising star emerges to challenge Scott’s seemingly unbreakable and brutal authority. Power Play continues the theme of corrupting power and infighting at the heart of E J Greenway’s first novel, Party Games. It is a wry look at what could happen if a modern day political party, finding itself in Opposition after years in power, embraces a narcissistic maniac who promises to bring it back from the brink at any cost. 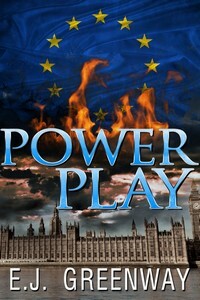 Although Power Play is the dramatic sequel to Party Games, it can be read as a stand-alone book.